We are small hobby breeders of Chartreux cats based in the village of Stotfold in Hertfordshire. The Chatreux is a relatively new breed to the UK and originates from France. 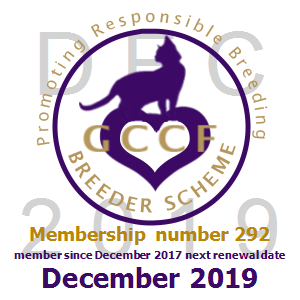 We are members of the newly formed Chartreux Cat Club UK (CCCUK) of which Helene is the Treasurer and the club has just been recognised by the GCCF. Our aim is to breed healthy, happy and well-adjusted cats who are a pleasure to own. All kittens are born and raised in the home and lavished with love and affection. Each kitten will be fully vaccinated, including leukaemia and ready for their new home at thirteen weeks, in accordance with the GCCF guidelines. First and foremost the health and well-being of our cats and kittens is our top priority. The Chautreux is a house cat which loves to spend it’s time within the family home. This means that they are very well socialised cats and are accustomed to everyday life and household noises.